Are you an Angel/VC investor looking for a Unicorn? Check Out this Investor Deck and Contact Now! Why is PAYBOOKCLUB a potential Unicorn? 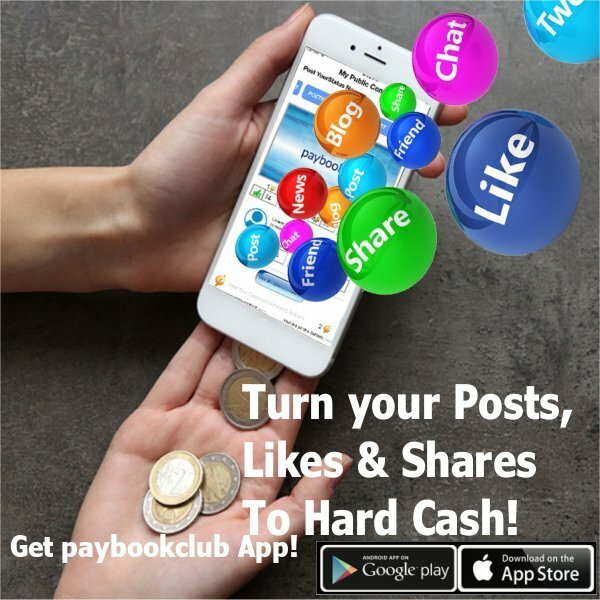 Paybookclub is a futuristic, cloud based, AI driven content creation and monetizing platform built on a social network on mobiles. Paybookclub aims to be the Content Marketplace of the World by 2020 by providing cloud based infrastructure and services for networking, publishing and sharing content. 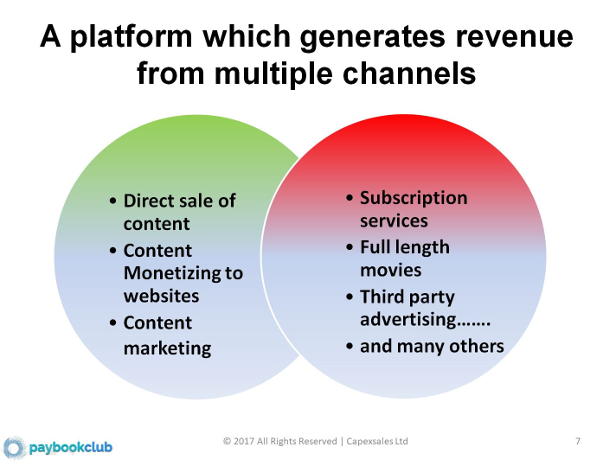 However the unique feature differentiating Paybookclub is that members get paid for their content and for the likes, shares and coments they make on content posted by other members. Members will also get a monthly loyalty reward based on the time they spend on paybookclub. 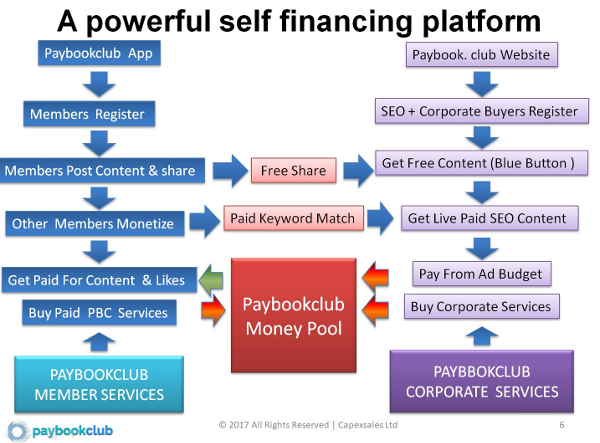 The paybookclub platform is built on the Amazon Web Services using strong and secure APIs which allows revenue generation in a number of ways in addition to content sale and content monetising to SEO. Apart from the advertising services to business, several paid services like games, e document safe, money transfer will be offered to members. The corporate sector will be offered data, sentiment analysis and other marketing information. Media services like full length movies will form several innovative revenue channels. Strategic tie up with cell phone manufacturers and banks and payment gateways will augment the revenue much beyond the Paybookclub platform. Paybookclub Content Box is already installed on several web sites and is going VIRAL. Just copy and paste this code in your page html for free and fresh content. To see how fresh content is generated automatically everytime your page is visited, please download Paybookclub app and sign up. Then try posting your content on Public Timeline and click the "Monetise" link. You can see how your content will appear on thousands of web pages simultaneously in our content boxes. Where is the evidence for a potential Unicorn? As start ups, the social media giants could not predict how fast or big they will grow. Today, it is possible to test out an idea on social media itself. Paybookclub's core idea of rewarding its members in cash by sharing the revenue has been approved by 30 % facebookers during our tests. More than 10000 users downloaded the App in a single day after a Press meet. 14000 App Installs for a potential Unicorn? Based on more than 14000 app installs even before the platform is fully launched, showing a strong interest from the public, and the growth of recent Mobile App based ventures like SNAPCHAT, we are able to build a revenue model and projections for Five Years which shows a potential UNICORN. Unlike the social media giants during early stages, today we can estimate our revenue generation and where we will be in five years from now, thanks to social media. We are currently raising USD 3 Million for Phase2 development, in Series A equity participation. In order to maximise public participation, we have set the MINIMUM investment for this Fund raise as low as USD 10,000. In addition, investment for equity participation will be accepted through SAFE (Simple Agreemmment for Future Equity) which allows you to invest any amount as an informal share holder, till the next fund raise when SAFE will be converted to equity. If you are an Angel/VC investor with a budget of USD 10,000 please contact us on +447721170136 for formal INVESTOR documentation or fill out the form below Now. We will get back to you ASAP. Besides the current raise of USD 3 Million, collaboration with a variety of service provides like, cloud services, banking services and management companies who will directly invest in the venture also will be explored.